Summer is unofficially over and the summer concert series wrapped up. The highlights was definitely Cher. I had never photographed her in concert before and if I had a “bucket list,” she was definitely on it. When I got the call the shoot her ending Gay Pride Week, I was super excited. I went in with a major headache and left feeling on top of the world. The crowd was one of the best crowds I ever experienced in my 30 plus years of shooting concerts and shooting with my friend Kristina made the show even that more enjoyable. I didn’t know anything about Macklemore and Ryan Lewis other than my nephew asking me if I ever shot them. So, when the opportunity came to shoot them, I did and all I can say is WOW! It’s been a VERY long time since I shot a band I knew nothing about and would have liked to have had more than 3 songs. This is a band I think will be around for awhile and here is the amazing thing-they do not have a record label and have achieved success all on their own by doing it their way. Lil Mix and Emblem3 are 2 other groups I never heard of but when I was asked to shoot them inside the Good Morning America Studios and a friend from California told me her daughter was friends with the guys in Emblem3, I thought it would be interesting. Both groups had a ton of energy, nice personalities and very catchy songs that I found myself singing the rest of the weekend. 98 Degrees Reunion. What can I say? I like these guys. When I first moved to NYC in 1999, I was asked to shoot them backstage at Jones Beach in Long Island receiving their platinum album and they were just the nicest guys. 14 years later-they are the same. Still cute too! One Direction-I think I still hear ringing in my ears from all the girls screaming. Gary US Bonds birthday bash along with Southside Johnny and Chubby Checker-a great night! BB King at BB Kings-a legend playing at his own club. SUPURB! Alicia Keys-love her. She has never disappointed. A lot of other shows that were huge but I don’t really understand why. I love music, and to me, MUSICIANS should SING, NOT lip sync. People will always defend these saying “but they are dancing-it’s hard to sing and dance.” All I can say to that is-Pink REALLY sings and her show is very physical. Bruce Springsteen, who I have been shooting since 1980, SINGS. His shows to this day are 3 plus hours and he is close to 64 years old, and he really SINGS. And-he doesn’t stay in one play on the stage-his stage is huge and he is running all over it, body surfing the crowd and jumping on the piano. If he can sing, why can’t everyone else? Why? Because so many of today’s “music” can’t sing-their voices are pitiful and mastered in the studio. So here is some advice for all those that do lip sync-LEARN to lip sync so it LOOKS like you are really singing. When the microphone is away from your face and we still hear your voice, that’s pretty bad. Fall is here and I look forward to shooting Cher again on September 23 and then the launch of my first book, Bruce Springsteen IN FOCUS Photographs 1980-2012 which is officially released on October 1. 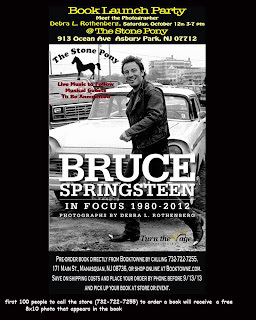 The book launch party is from 3-7pm on Saturday October 12 at the Stone Pony in Asbury Park. It is free and open to everyone. To order a book, call Booktown in Manasquan, NJ at 732-722-7255.